Yet another Lebanese dish, we’ll have to move onto another theme soon! This is delicious and quite rich so probably best served as a mezze dish or shared starter, though it will feed 2 people as a main dish. Mix all the sauce ingredients together in a bowl. Pour the sauce into an ovenproof dish and put in the oven to warm. Cut each fillet in half, score the skin with 2 slashes, and season well. Heat a frying pan, add the butter, and when melted, add the fish, skin side down. Cook for about 2 minutes or until the skin is crispy and golden. Turn the fillets over and cook for another minute or two until the flesh flakes easily. 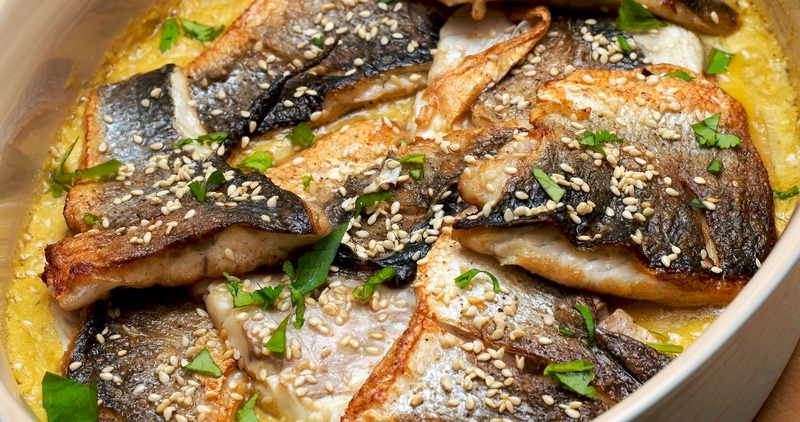 Take the dish out of the oven, add the fish to the sauce, and sprinkle with sesame seeds. Put the dish back into the oven for 5 minutes. Sprinkle with chopped coriander and a squeeze of lemon before serving. Wine Suggestion: A full-bodied textural white, like an oaked Vermentino.